Please excuse the "I'm so unimpressed" look on my face right now. It was really early and my caffeine hadn't kicked in yet...but hey, at least there's a photo in this post! So most of you will remember that I've been on a quest for a decent-fitting pair of slippers, and that I wanted a pair of Noro slippers so I could have fun, pretty stripes to brighten up my winter nights. And you'll all remember how badly that quest was going. My second failed attempt at a pair of Noro Fuzzy Feet was just that...a giant failure (literally). I tried to felt them in the laundry mat in my complex, and learned that high-efficiency washers and felting don't mix. Two trips through and they were still giant scuba feet. Then Ann took over and put them through four washes at her house, and they only got down to roughly a woman's size 12. Thankfully, one of my students has a friend with size 11 feet so I just passed them right along to her. 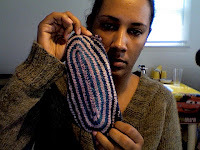 Next I tried to knit a more traditional, moccasin-style pair, but they were really large too and I just didn't feel confident that they would stay on my feet when I went up and down my stairs. Safety first. 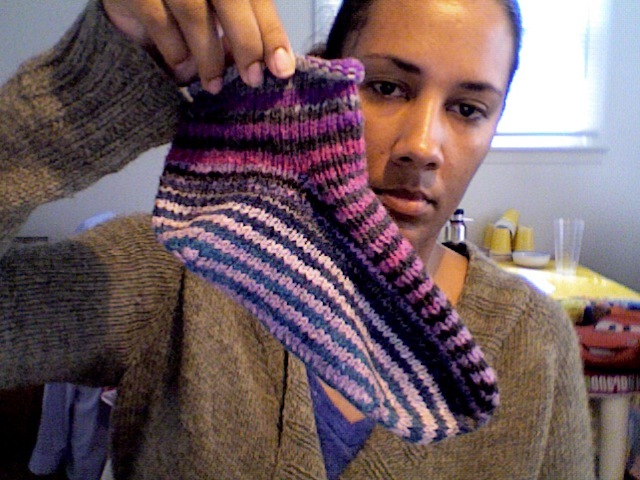 While I was knitting my second pair (a very well written pattern and a very cute pair of slippers, but they just weren't exactly what I was going for), I was thinking about "the ways I would do these differently". After almost finishing the first one, I took the entire thing apart and started over. I made a few changes to the original, like slimming it down quite a bit, working from the top-down, and I completely changed the sole of the foot. 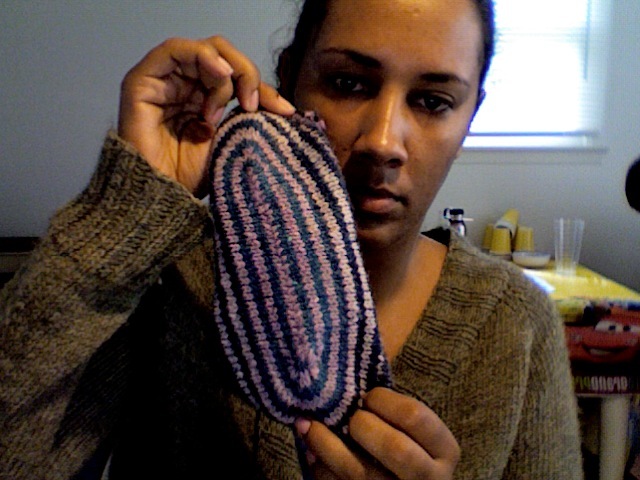 As you can see here, I've got an oval-thing happening on the bottom and the very center is grafted shut. I worked out a rough pattern which I've sent to the ever-talented Daisy. It's got three sizes, and instructions on how to alter it to fit more feet (like children, or giants). I'll be bringing these to you at a later date, when all is worked out. Anyway, about that air popper. Yesterday we took Alex to Target to use his gift cards (which he received for his birthday). He had a blast picking, and repicking items to buy. 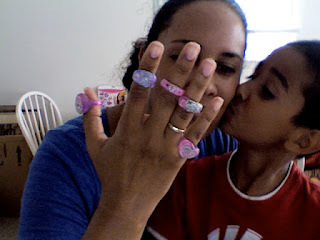 We had lots of stuff in our cart, but he eventually settled on a 3-pack of Skylanders figures for his game, a Scooby-Doo DVD (one of the rare ones we don't already have, lol), and a craft kit to make jewelry (he made a ring for his kindergarten-girlfriend, lol). Meanwhile, I wandered by a shelf that had buffalo-flavored popcorn seasoning, and that sent me on a quest. We needed a popcorn maker. I don't even really like popcorn, lol. But then I remembered eating it as a child, and that I used to like it, and that it's really microwave popcorn that I don't like...so I got an air popper. And some popcorn. And the buffalo flavoring that started it all. And some white-chocolate covered animal crackers (in the interest of full disclosure). I've made two batches of popcorn since last night and I'm working out the perfect amount of butter, salt, and various other seasonings. Good thing I went for the air popper instead of the oil popper. I'm going to Grad School!! I'll be starting my Masters degree in Applied Behavior Analysis starting September 19. And as a major bonus, I get to skip the GRE's because I've got a GPA of 3.95, and as a returning student, I'll save 20% on my tuition!! I've been praying about this for a long time now, and everything came together so smoothly that I know I'm on the right path. Now, I just have to concentrate long enough to actually finish this Bachelors first. Cambria, CONGRATULATIONS on your grad school plans! That sounds like a pretty sweet deal. Jaydon is getting closer to the age that Alex was when we moved away, and hence reminding me of him in certain ways. It's kind of sad to think of how Alex and Dante are growing and we're missing it. Guess that's one of the downsides of moving.